ART SWAP! I Drew a Maze For a Friend, and Wait Until You See What He Created For Me | Keep It Up, David! The poem is incredible. This isn’t some nursery rhyme or greeting card pablum, it’s, like, literature. Wanna read it? I wish I knew how to write about poetry, but I really don’t, so all I can really share is how the poem makes me feel, and maybe that’s how you write about poetry after all. It sent a shiver up my spine. Goosebumps popped up on my forearms. It boggles me how Josh was able to tell my story so briefly yet so specifically, and most of all so artfully. It’s wonderful. Thank you, Josh. Josh shared a little bit about how he approached this, and he put a lot of thought and work into it. He was inspired by a poem by Rainer Maria Rilke, a Bohemian poet who lived a hundred years ago. (Read the poem here.) He borrowed that poem’s basic structure, and even the ending words from each line, and recrafted it to tell this story. He chose to format it the way he did to evoke stairs. Oh, and it’s not lost on me that his inspiration poem is about a statue of a Greek god. Flattered! 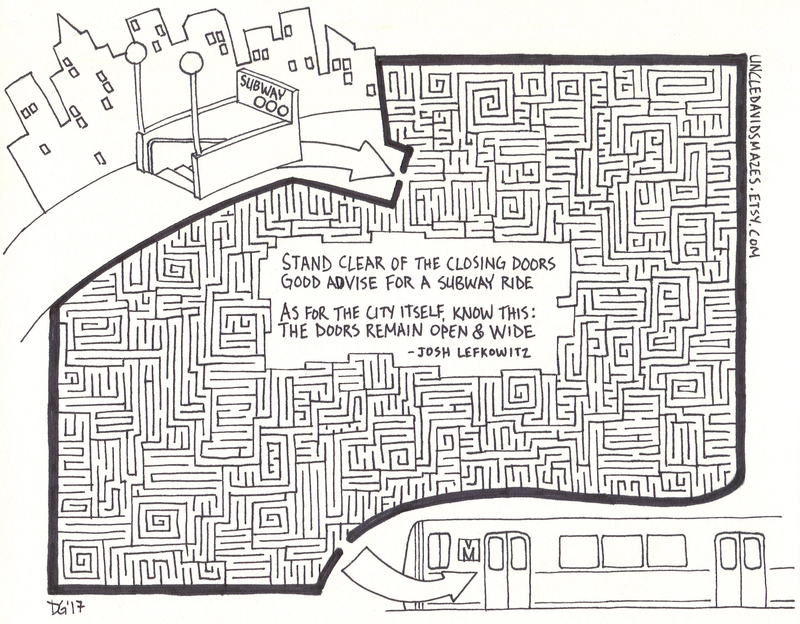 In exchange, I drew a maze for Josh. I wanted the maze to be poetry-themed, and that’s a tall order. So I brushed up on Josh’s work and read about his accomplishments, until I stumbled upon a new poem that Josh had written for a New York City-based contest. 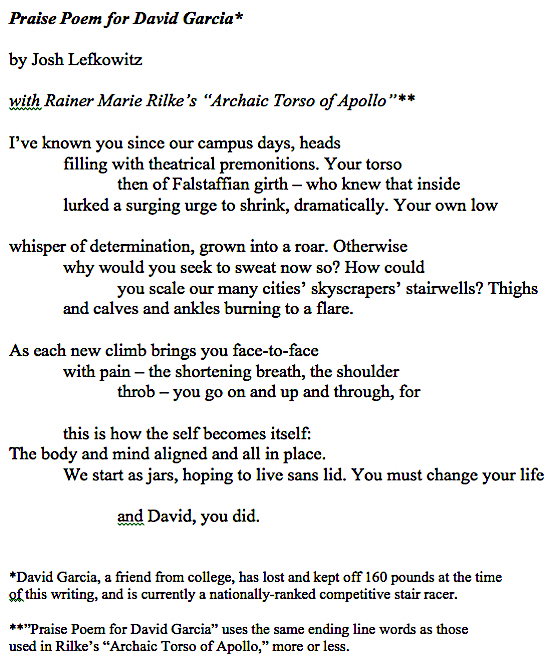 The poem had to fit within one tweet – and Josh won, and it was published! Since the poem was on the shorter side, and had a very visual subject matter, I built the maze around that. I think it turned out well, and Josh loves it. Having creative friends is the best! Josh isn’t the only one who’s been writing about me. I’m featured in the new issue of Energy Times! It’s the May/June issue, with Peg Bundy Katey Sagal on the cover. 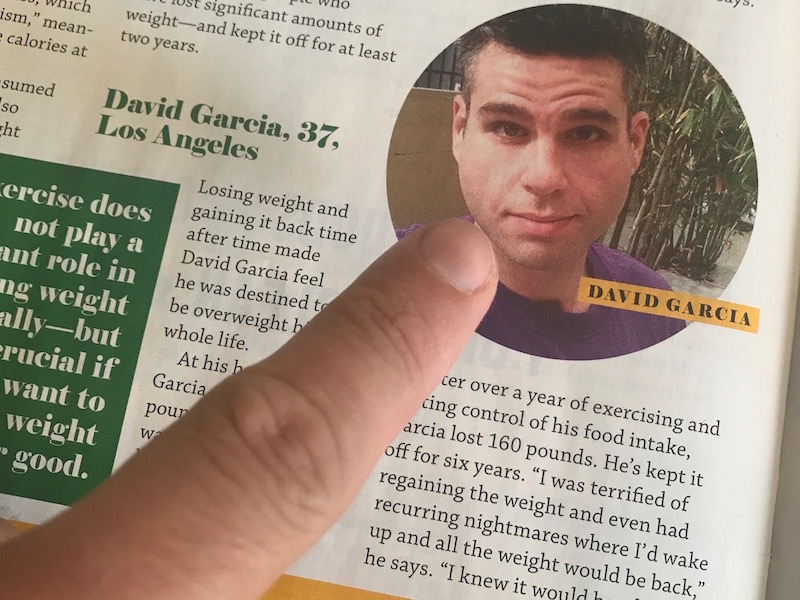 Energy Times’ mission is “enhancing your vitality through nutrition, health and harmony.” On page 36 there’s a 5-page article called “Losing It For Good: Meet Four People Who’ve Lost Weight – and Kept It Off.” And I’m one of the four! It’s a good article, and one I kinda forgot about, since I did the interview way back in October. 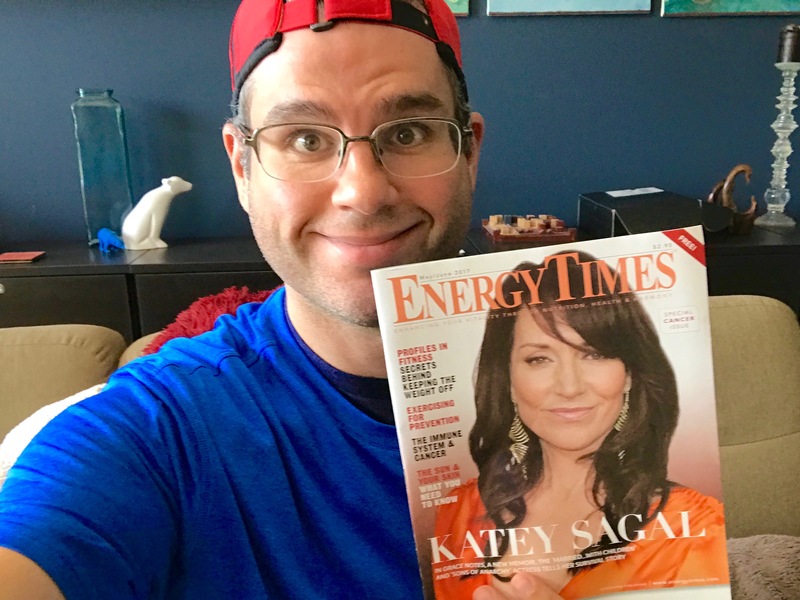 You can pick up Energy Times (it’s free) at a lot of health food stores (plug in your zip code here to see which stores are near you), or just read the article online! This entry was posted on Thursday, May 25th, 2017 at 8:45 am and is filed under Uncategorized. You can follow any responses to this entry through the RSS 2.0 feed. You can leave a response, or trackback from your own site. Wow! Just in the last few months you’ve been on TV, a Podcast, a public speaking engagement at the Getty, and now a Poem AND an article about you! KEEP IT UP! I think it’s about time for another stair race! Perhaps one that involves TWO Towers! The Staircation is almost over. Absolutely awesome news, David! Thanks for sharing the poem & Energy Times article! I’m so happy for you because your healthy fitness-accomplishments influence society in a positive & lasting way. Thank you, George! Your dedication and focus inspires me. Hope you’re enjoying the long weekend!